The Kirchners literally couldn’t sleep, kept awake by the thoughts of that woman, and who knows how many in similar circumstances, wandering the night looking for a warm place to sleep as the temperature dipped below zero. By morning, they had agreed that something needed to be done. Kirchner went to work, reaching out to her network and the community at large to organize a meeting to examine the issue. With the cold snap worsening, the need was becoming more pressing every night. The group brainstormed the problem, and realized that the plight of those living out in the frigid winter elements was too immediate to spend much time on organization. “We needed to pull together the resources to help right now, while the situation was critical,” said Kirchner. By the end of the second meeting, sources of relief were identified, action teams had been formed, and a strategy was put into effect. Team leaders went to work, including Dawn Dexter, a community activist and organizer who suggested and helped develop a “street sheet,” or guide to resources for the homeless and others when the weather is hostile or resources scarce. She had been working with the problems of homelessness and the social systems that create them for a number of years, and had spoken with homeless panhandlers at the intersection of Highways 82/133. Her experiences had produced a perspective that is, to some degree, at odds with many assumptions about homelessness. “The principal causes underlying homelessness are NOT alcohol and substance abuse, or even mental illness,” Dexter said, although these are often features of a homeless lifestyle. “Homelessness is the result of economic disadvantage, pure and simple. 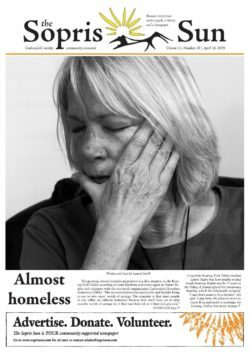 We can’t solve homelessness without looking very hard at economic, wage and opportunity disparity.” She continued: “We’ve talked about the lack of shelter facilities in Carbondale. Aspen and Glenwood both have shelters, but these kinds of facilities often have very strict rules and limitations as to who can stay there. In most shelters, couples and families are often split up, single mothers are not allowed, and so on. So in many cases, the very relationships that people on the street need to ground them in their uncertain lives are denied them if they want to sleep in a bed for the night. “The CHA is a great response to an emergency need,” Dexter continued, “but we need to go beyond the provision of emergency resources to address the larger issues in community. Economic disparity is one of these, but at a deeper level we need to learn to recognize the basic humanity, the ‘personhood’ of people who are trapped on the street. And while we’re doing that, we need to recognize the diversity of social causes of homelessness and stop scapegoating people who are struggling to live in this community, and work to identify the ‘invisible’ homeless who are sleeping in their cars, bouncing from one friend’s couch to another, or otherwise lacking stable housing. Whatever help we can give to people, the bottom line is that we need to get them into housing.” To that end, Dexter and others have developed another organization (Shining Mountain Homes for All) to address housing availability specifically and raise funds to build “tiny homes” and other affordable alternative housing. Editor’s note: Carbondale Homeless Assistance, and Shining Mountain Homes for All, are accepting donations on Facebook and through crowd funding). Published in The Sopris Sun on February 18, 2016.